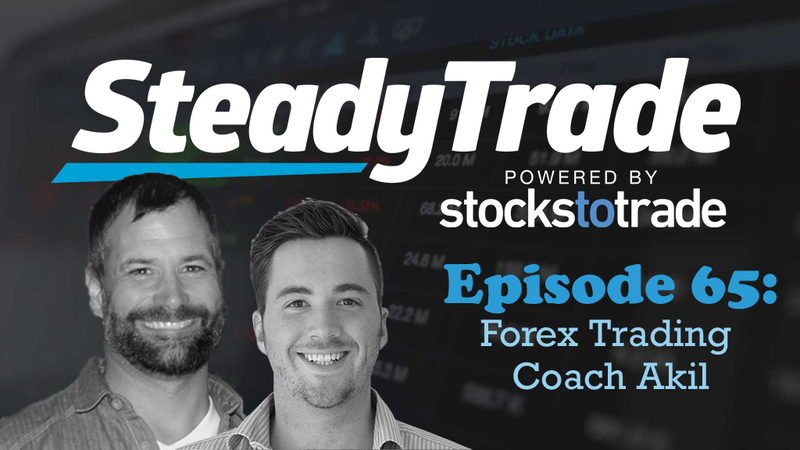 In this episode, the SteadyTrade Podcast takes a brief break from its typical penny stock-centric focus and dives into the waters of forex trading. Forex, or foreign exchange trading, is a method of trading not stocks, but foreign currencies. In today’s episode, hosts Tim Bohen and Stephen Johnson interview Akil Stokes, a forex trader, mentor, and host of the podcast The Trading Coach. What’s the Deal With Forex? Foreign exchange trading is a method of trading foreign currencies in hopes of netting profits from conversion fluctuations. The forex market is one of the largest financial markets in the world, with trillions of dollars traded per day (between 3 and 5 trillion, depending on who you ask). With forex trading, you’re trading the different exchange rates between the currencies of different countries. Unlike stocks, where you’re investing in a company, it’s more like a head-to-head battle between one currency and another. So while you’ll still execute trades, it’s a different overall style of trading. Akil Stokes wasn’t born a forex master … actually, the first stock he bought was Apple. When Akil wasn’t making money in penny stocks, he figured he’d keep trying different methods of trading. He tried forex, and something about it just clicked. He quickly grew to enjoy the game and gained a passion for the process. As his life began to get serious (getting married, having a family), he got serious about forex, too. When he realized he wasn’t earning the profits he hoped for, Akil got serious about tracking his trades. That’s when he began to turn a corner and become successful in earnest. In the episode, you’ll learn about Akil’s slow-but-steady progress as a trader. You’ll learn about the tricks he used, like focusing on diminishing errors. For instance, if he made 30 mistakes last month, he’d try to make just 29 this month. This long-term approach was effective: He began to profit regularly. Ultimately, he had to shift his focus from making money to actually doing things the right way before that could happen, though. A 24-hour market: Forex trading doesn’t need to adhere to market hours. There’s opportunity around the clock, so it’s suitable for any schedule, even if you have a full-time job. Higher competition: Many big-time investors aren’t interested in penny stocks, which means there are openings for new investors to explore the market. But forex attracts some of the best of the best, so there can be a higher level of competition. Trading wisdom: A profitable trade isn’t necessarily a good trade, and a losing trade isn’t necessarily a bad trade. The learning curve: In both forex and penny stocks, it’s important to learn the basics. But at a certain point, you’ve got to spread your wings and fly. You can’t paper trade forever. Passion for the process matters: Akil credits a passion for the process of forex trading to be one of the keys to his success — could the same be true for successful penny stock traders? Don’t have the money? Learn the skill. You’re not going to get rich overnight, in spite of what promoters or “gurus” might tell you. It takes time. Akil also shares his highest and lowest moments as a trader. In closing, he shares general parting wisdom that is appropriate for traders of all levels: It’s only when you strive to find consistency in the process — rather than in the outcome of a trade — that you can hit your stride as a trader. Do you have an inquiry about forex trading, or another trading-related question? Visit the “submit your audio” portion of the website to ask us anything. Love these podcasts! Great guest! Great info! Thank you!! “The Process”. It doesn’t matter what you are trading, you must follow the process. thanks guys. Great podcast and Thank You Akil.